Testimony is making major waves in the LMAM music scene. This gospel prince has a LIMA best song of the year and has been leading troubled youths from the streets into a righteous path. Testimony, originally born as Saliu Aliyu Olaiwola had a blossoming career before he found the church. 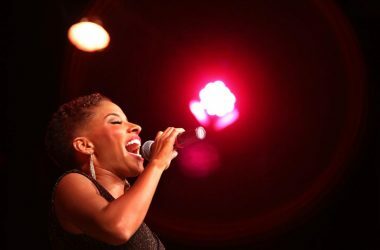 Long before the gospel crossover, the artist was a rising secular star creating music and collaborating with some of the industry’s hottest artists. 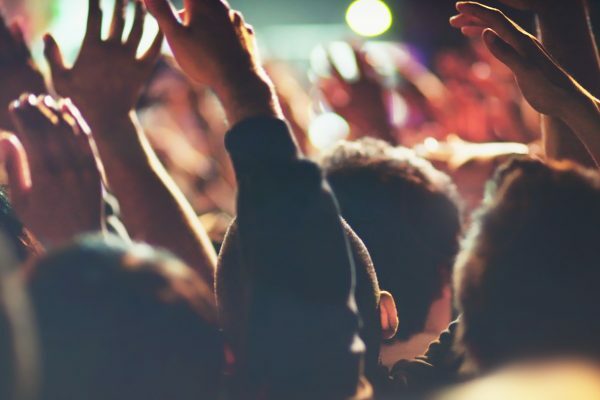 It took some time for the musician to make it into the world of gospel, but when Testimony stumbled into church music, it changed his life forever. Testimony fell into the church from an unfortunate incident. In 2011 the artist was wrongly accused of stealing a car. With no support and no evidence to back him up, the police arrested the rising star and sent him to prison for 4 months. It was in there, that Testimony prayed with all his might to God to see him through. Fortunately for him, his prayers were heard, and the musician was released. It was on that day that Testimony found himself in Christ Embassy, the church of Pastor Chris Oyakhilome. Pastor Chris welcomed the young artist and saw his potential. He believed in him, nurtured him and gave him a platform on which he could create music and reach millions of people. This gave Testimony a new sense of hope and belief, not only in God but also in himself. With all of this support, this led the artist to discover new ways to spread his message, thus the ‘Street Gospel Movement‘ was born. 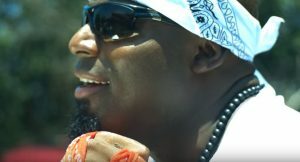 The New Street Gospel Movement is a movement that uses music to spread the word of God to struggling street youths. This is a big part of Testimony’s work. He spends a lot of time finding kids to reach out to. He approaches these kids with his music and just simply talks to them, telling them, with a song, that there is a better path. Countless Nigerian kids love Testimony’s music, as well as many around the world. They feel that he really speaks to them. 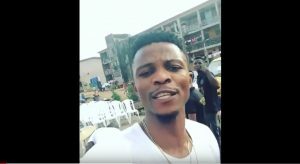 This has gained him a massive amount of popularity, with people even dubbing him as the gospel version’ of the famous Nigerian musician, Olamide, ‘The King of the Streets’. Testimony is without a doubt one of these major talents. 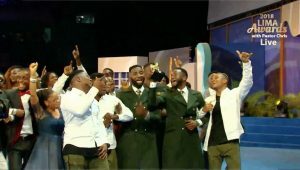 His song ‘Jehovah’ won him the LIMA song of the year in the Proto-stars category, yet the ‘boy from the streets’ insists that all of his success is because of one man, Pastor Chris Oyakhilome. Check out all the winners of the 2018 LIMA awards and enjoy these memorable moments. 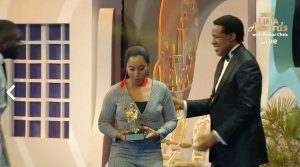 The LIMA awards brought this year’s IPPC to a close, and according to Pastor Chris, was the most successful one to date. 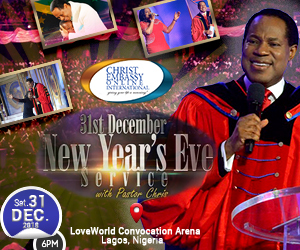 Pastor Chris expressed that Christ Embassy has reached new heights. The ‘man of God’, as he is known to his millions of devotees, spoke of this record breaking achievement. 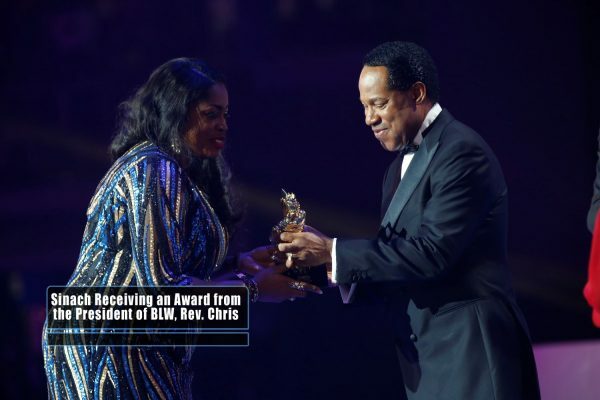 Pastor Chris celebrated the many talented gospel musicians that graced the stage. 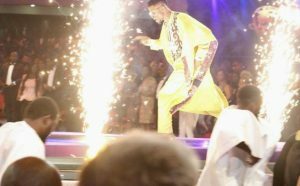 The event, that was held at the Loveworld Convocation Arena, in Lagos Nigeria, performed their amazing hits and were praised for the beautiful melodies and dedication to the word of God. There were many crowd favorites and also newcomers. This year was larger and more majestic than previous years. 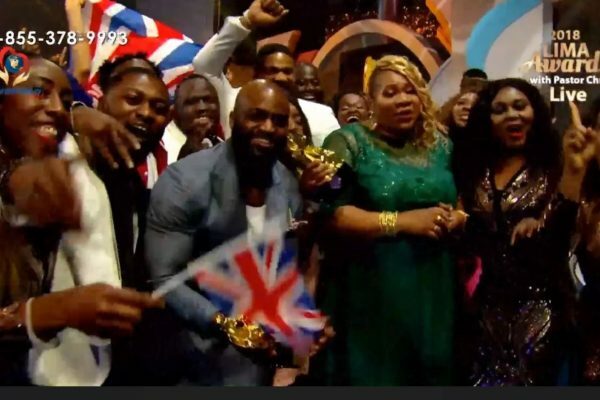 Christ Embassy has achieved the unthinkable. In the year 2018, the year as Pastor Chris has called it, the year of the Supernatural. Get ready for LIMA 2018! The 2018 International Pastors’ and Partners’ Conference proudly presents the LoveWorld International Music & Arts awards (LIMA). The event is happening this evening! Preparations are well underway, and have been since last night. 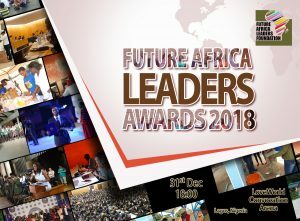 The spectacular award ceremony will take place at the Loveworld Convocation Arena, in Lagos Nigeria tonight! 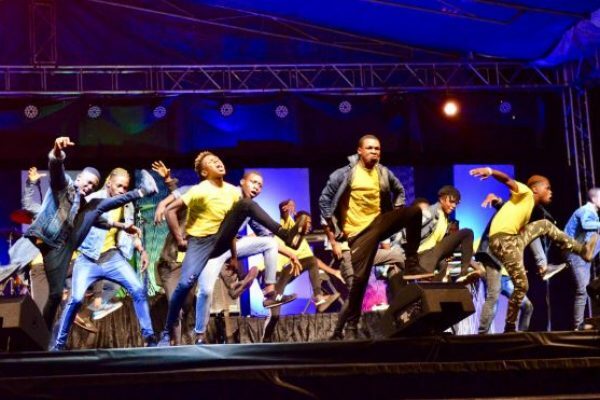 Last year was a spectacle of glorious performances, completely inspired by the word of God. Its time to get ready for another unforgettable show. 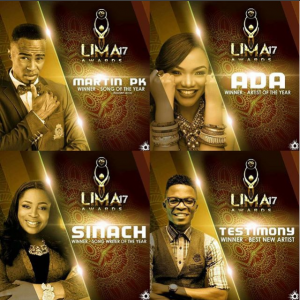 The LIMA awards are a Christ centered musical extravaganza which features the world’s top Christ Embassy gospel musicians. The event was designed to showcase these creative talents, recognize and celebrate these talented musicians that inspire millions with the word of God. Last year’s LIMA awards were simply breathtaking with memorable performances by artists who blew audiences away. 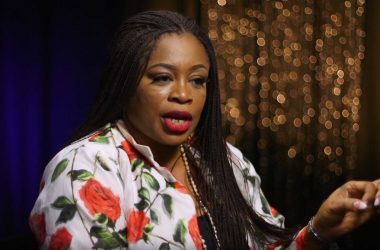 The four winners last year were Martin PK for song of the year, Ada for artist of the year, Sinach for songwriter of the year and Testimony for best new artist. These four artists dazzled the thousands before them on stage, making it one of the most unforgettable nights of the International Pastors’ and Partners Conference of 2018. This year is expected to be even larger and more majestic than the previous year. Christ Embassy has achieved the unthinkable. 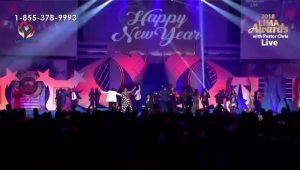 In the year 2018, the year as Pastor Chris has called it, the year of the Supernatural. There are hopefuls tonight. LMAM gospel scene has been blowing up. Millions are looking forward to hearing their old favourites and of course the many newcomers. 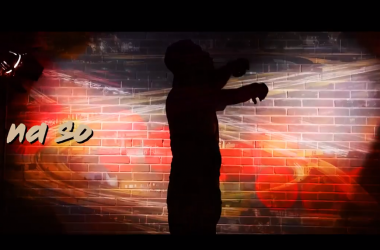 A lot of buzz has been happening around UR Flame’s November hit, “Something to shout about“. I guess we will have to wait and see, in any case, millions of fan will certainly have much to shout about this coming evening. Along with all the talented artists was Rev. Chris will be cheering them on and affirming the importance of Gospel music in our world today. His mere presence is inspirational and pivotal moment in all lives. These types of events affirm the importance of the Christ Embassy and the Healing School. It’s hard these days to find places that support young and experienced singers that take upon themselves to spread the Gospel of Jesus. But at LIMA preaching for Christ is the norm making the whole experience a spiritual lifting event in the lives of attendees. Stay tuned for more updates about tonight. 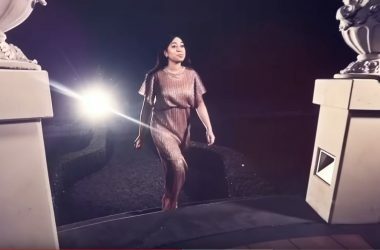 Check out the LIMA awards promo right here on Ceflix. Watch the LIMA awards live here. 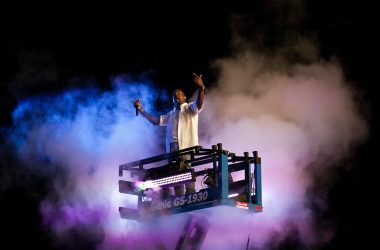 The Derizo concert just concluded a few days ago. 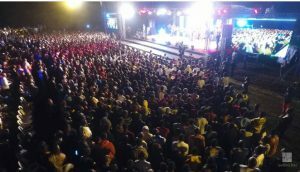 The Christ Embassy organized event was attended by a whopping 22, 000 people in collaboration with LoveWorld Music and Arts Ministry, and was held in the beautiful city of Benin, Nigeria. Drone view of the massive crowd present at Derizo Concert. 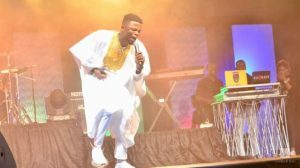 The concert welcomed the thousands of people to the musical extravaganza, where musicians like T-Sharp, Chris Shalom, Obi Shine, UR Flames, Jerry K, Ayo Vincent, Testimony Jaga, Rozey, Agent Snypa, Sister Wisdom and a selection of anointed and talented artistes from the zone inspired, moved and enchanted the crowds with their holy music. LMAM artiste, Testimony Jaga, ministering in music. The esteemed Zonal Pastor addressing the congregation in the company of the LMAM Director. Among the spectacular performances, there were also multiple amazing testimonies made. A particular one that stood out was the testimony of a lady who was suffering breast cancer. 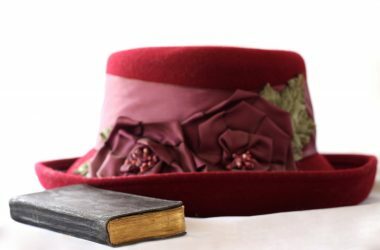 The woman had a lump in her breast but in the middle of worship, it miraculously disappeared. 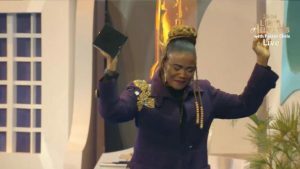 Notable was the testimony of a lady who had suffered from breast cancer and had a lump in her breast, but as the worship continued, she noticed the lump had suddenly disappeared. Like always, the Derizo concert is always a memorable event. 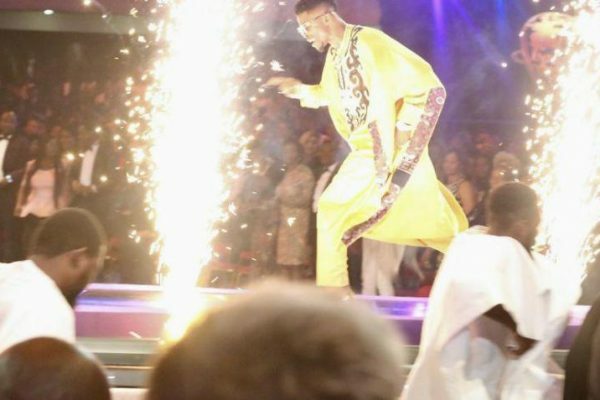 As the show drew to a close, the artistes expressed their deep gratitude to their fans. It was an opportunity for fans to meet and interact with so many Gospel Artistes whom they only see from their TV Screen. Due the immensely positive response, organizers have already eagerly expressed their upcoming plans for the next Derizo concert, stay tuned! Since the birth of the Pastor Chris‘s incredible Christ Embassy church, many prominent church figures have emerged from the holy sanctuary. Some of them have gone on to be highly successful spiritual leaders, while some have been busy in other ventures, such as music. 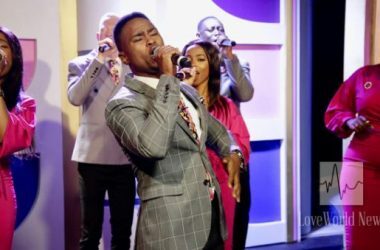 These mega musicians are a force the church gospel world, inspiring their millions of followers with their praise, they are also the major players of the LoveWorld Music Ministry. While there is a huge amount of talent out there, we have picked out our top 5! Before Buchi rose to stardom as a Nigeria’s top reggae artist, the young man in fact was an English literature lecturer in the university of Lagos. Academic by day, Buchi started getting into the music scene after hours in some of Lagos’s hottest nightclubs as a DJ. 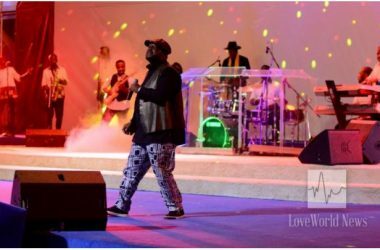 In early 1990’s Atuonwu made his way into Christ Embassy church, the transition into reggae gospel, propelled him to becoming a multi award winning artiste. 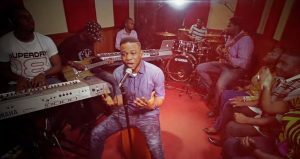 The South African based Nigerian gospel singer comes from a family of musicians which steered him in the direction of music. Lawrence ultimately found his way into the gospel by having an unfortunate accident, leaving him badly injured. Thankful for surviving, he strengthened his connection to God and began singing in the church choir. This inspired him to write music and create the hit song ‘Hands in the Air’. The talented musician also produces and even started his own record label. 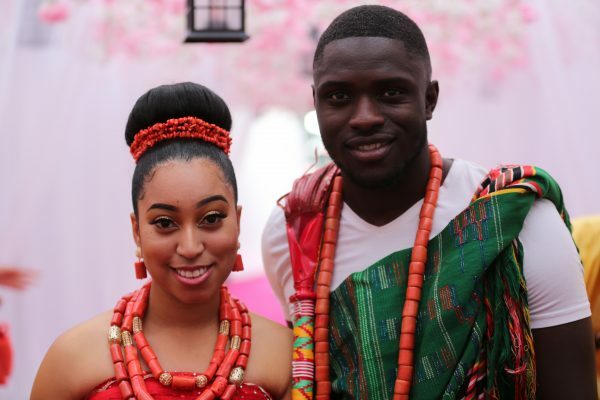 Joseph Omo Ebhodaghe, the man behind the song ‘Mighty God’. 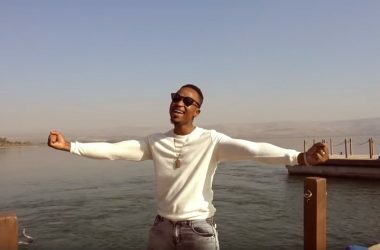 This hit song blew gospel fans away making him the star he is today. Today he serves as the praise and worship leader in Christ Embassy and has even collaborated with Sinach. 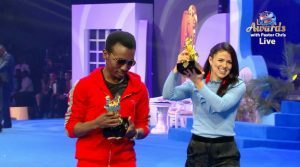 In 2010 he won song of the year at the Love World Awards. 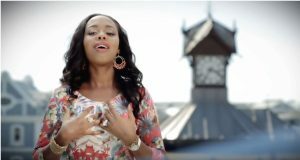 Praize has also won awards such as the song of the year in 2010 and is also a Christ Embassy worship leader. 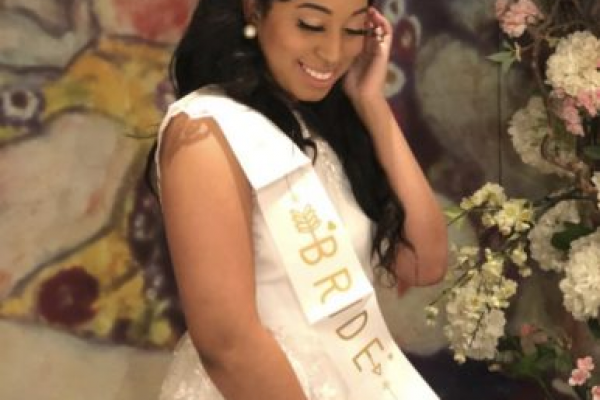 Ayo started singing in her church choir at just seven years old! 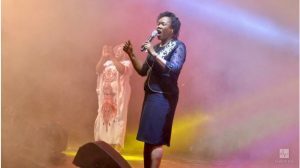 The talented starlet has also been ministering In Christ Embassy for several years. 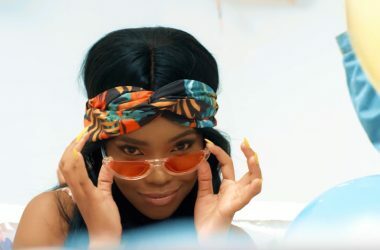 Ayo has been honing her skills as promising songwriter. 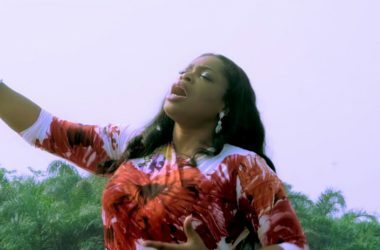 Her soulful voice has won her many collaborations with an array of artists, such as Samsong, Sinach, Femi Jacobs and Hope Davies, and more. 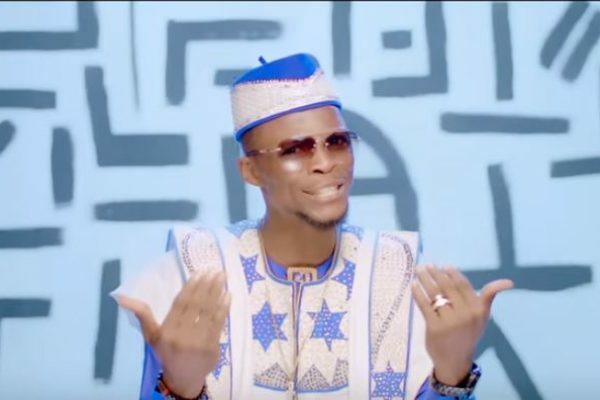 Vincent has taken won Best Music Video from the prestigious Crystal Awards in 2014, as well as African Gospel Music Awards 2014.